A one of a kind record from a talent so deep it kills you to learn… this is all there is. Straight out of Austin, TX this may be the best of the whole Armadillo/outlaw scene, though Willis never wanted a part of it in the first place. Country fans and foes alike should grab this record and hold on tight. Willis Alan Ramsey’s record merges country and soul as much as it combines chicken shack production with a touch of studio glitter. Put out by Leon Russell on his Shelter label (Russell also contributes keyboard), Ramsey was only twenty when he wrote many of these tunes, and only 22 or so when he laid down the vocals. Pretty remarkable considering the sound. It’s an ecclectic mix of styles with songwriter tunes ranging from the sweet and waltzy to bluesy, gritty grooves. “Muskrat Candlelight,” the album’s most sugary spot, would be covered by America and forever confined to the Lite 97s as “Muskrat Love.” But other tracks tear it up. All originals except for “Angel Eyes,” which fits like a glove on Side 2, every song is a serious keeper. This is awesome. Thanks! Never heard before. Really does sound like an absolutely fine record. Thanks for this. It’s people/music like this that I love discovering (the kinda ‘unknowns’ of the past). If i can find this record somewhere i’ll be purchasing it for sure. Totally classic album. Thanks for posting this. Really excited that you posted about this record. It is one of my favorites, and also one of my favorite albums to give to people who have a passion for music, genre preferances aside, it always seems to grab people. Thanks for talking about it. Mr. Ramsey was on a panel and played a few songs at a Woodie Guthrie tribute at the Smithsonian American History Museum in 2000, which was how I first learned of him. He was fascinating to hear speak. Jimmy LaFave and Dave Marsh also spoke. It was a terrific event. There is a worthwhile chapter on WAR in Jan Reid’s book The Improbable Rise of Redneck Rock, an of-the-era survey for Austin’s then-burgeoning country scene. The book covers some fascinating characters and records that time has relegated to the dollar bins. This is great! Anyone know where I can get the whole album? He did have two songs (one covered by Eric Clapton “Positively” and one by himself “Sympathy For A Train”) on Mad Dogs & Okies, a 2005 collection that features JJ CAle, Bonnie Bramlett, Tony Joe White, Peter Frampton (? ), Ray Benson, Willie Nelson, Taj Mahal, Vince Gill and others…sure might be a nice one to look up and review again…it really is a great collection. Please Willis, before I die…one more full album…please? Looking forward to tracking this one down. Some good stuff on Shelter Records! I’ll never forget the first time I ever heard Freddie King – “Goin’ Down” from his Shelter best-of, blasting out of a record store in Davis, California. I was transfixed for about 5 minutes, then I went in and bought that thing right off the turntable. My Dad passed away today and strangely the album I reached for first and have been playing all day is this one. I’m sorry for your loss, Stuart. First time I have heard this. W O W. Just … wow. Thanks for covering it! Finally picked this record up this morning. I’m only up to the end of Side 1, but already…wow. This is really, really, really good. It sounds like the 15th and best album of a career artist, not a 22 year old’s first shot. Thanks so much for turning me on to this! Lyle Lovett’s been going on about him for years, but I just never made the connection. Glad I did. Thank you for this!!!! I love it – on a search to find the full album now. Saw Willis at Threadgill’s south store, Austin, TX Friday 5/14/10. Wow!! No discs at the show! amazing stuff, would love to see it again!! Anyone know where to get a copy of the old album for a good price? WAR has always been one of my favorites. When I was about 15 I heard he was going to perform at SMU in Dallas. It turned out he was in a relatively small room where most of us sat on the floor just a few feet away from Willis. It was such a memorable night listening to WAR sing and talk in such an intimate setting. I’d love to see a new album from him. 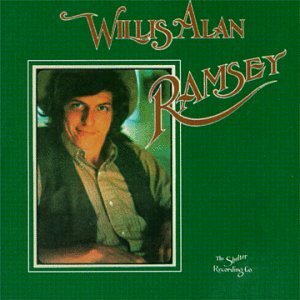 The “Angel Eyes” on this album is indeed by WIllis Alan Ramsey. The more well-known “Angel Eyes,” by Matt Dennis and Earl Brent, and sung by Sinatra and many others, is a different song with the same title.